Safe drinking water is essential to your family’s health and well being. Ever since I became a mom, I was so “praning” for what my family will use and take. I am in charge of budgeting, buying stuff and the total wellness of my family, so I am the first one who is affected and guilty if one of the members of the family is sick and not properly taken cared of. When my son was still a baby, I only buy water bottles from the grocery or drug stores. Drinking water is one of my major concern because we can’t live without it. When we were still in Paco, Manila, we bought a water filter from a hardware that was attached directly to our faucet. I used the water from there for cooking, and cleaning my son’s milk bottles but still I am not comfortable using it for drinking. We still buy our drinking water from refilling stations. According to an article released by Rappler, up to 40% of households nationwide and 60% of Metro Manila residents buy drinking water, and so we are included there. But the question is, are we 100% sure that the water from refilling station is safe? Well, to be honest, I don’t know. When we transferred here in Cavite, our water supply is from a deep well (underground water). It is not that clear compared to the water from Maynilad. We can’t even use it for cooking food. Getting Pureit will make you feel secured that you’ll getting the safest drinking water for you and your family. What about you, what do you do to ensure that your family is drinking safe water? It’s been 3 weeks and the taste is still unacceptable in my stomach. It’s too much chlorine. 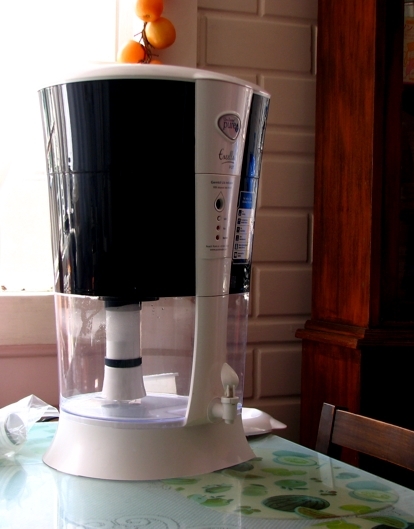 Clean water is supposed to be tasteless, but PureIt Excella Purifier after almost 3 weeks of use still tastes bad. I feel horrified thinking I might get cancer drinking your water or liver disease. Drinking water is not supposed to be a business for you. You should pull this out from the market. Don’t make a business out of other people’s would be illness after using your purifier. There are other purifiers which does not make the water chlorinated in taste. sorry to hear that. I think you need to use it frequently (and dispose the water from the unit – use it to wash the dishes maybe) until the water becomes tasteless. Purified water is especially helpful for babies. I love the concept of this kitchen gadget, it gives you healthy and safe drinking water without having to go outside.